Stunning aerial panorama of the Houston skyline right as the sunset behind us and the clouds were backlighted with these wonderful colors of the sunset reflecting in the tall buildings that make up down town Houston. 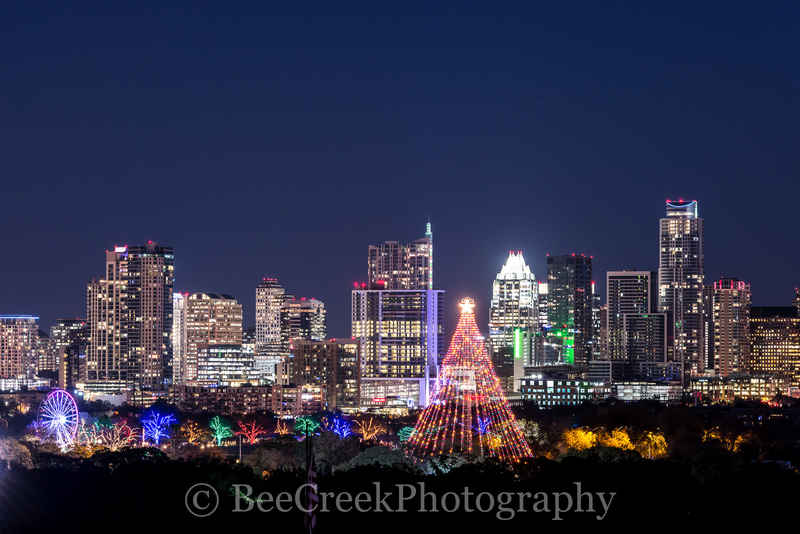 We got up close and personal in this image so we could capture it with the highway and all these modern skycrapers in the skyline from this angle of the city in downtown area looking toward the Theater District. This is a popular spot for the performing arts and it runs along the Buffalo Bayou in downtown. Using a aerial drone allowed us the ability to capture the image from a different perspective and since we use a full frame professional camera for our aerial images it has the highest resolution possible so it can be enlarged up to 108 x 35 without loss of any detail. Houston has a beautiful skyline on any day but today was exceptional with the help of our drone, so thanks for looking. Posted in Photo of the Day and tagged aerial, architecture, buildings, cityscape, downtown, high rise, Houston, houston skyline, skyline, skylines, skyscrapers, sunset on July 1, 2017 September 26, 2018 by Bee Creek Photo. 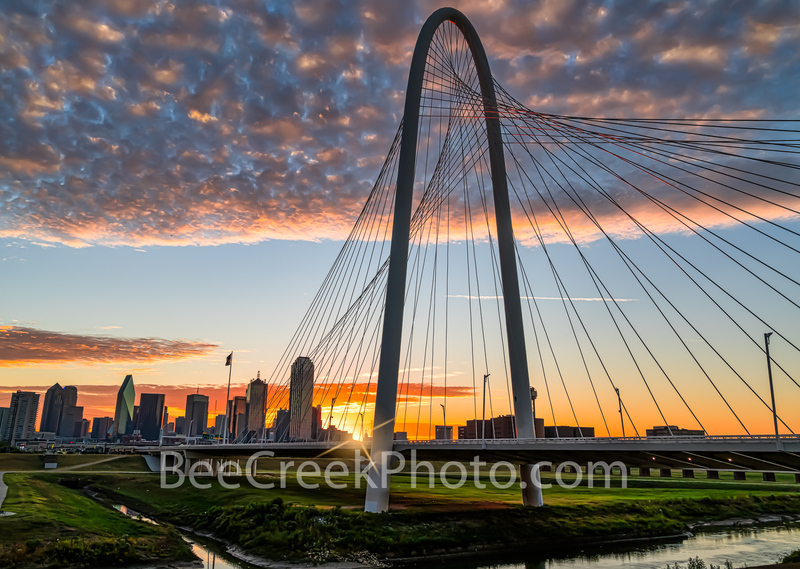 Here are some of our top images of Houston Skyline and the Cities most popular sites. Houston is one of the largest city in the Southern US it has a population of over 2 million people and is very diverse. The city is home to Houston ship channel, the art district, opera, sports teams, the medical center along with several universities, Aquarian, museums, and many parks, along with a large convention center the “George Brown Convention” in the heart of downtown with the Discovery Green Park across the street. You will also find some of the tallest skyscrapers in the southern United States located here, which make for some nice skyline images. We have many more images of the Houston area so check out our website for more images like these. 1. 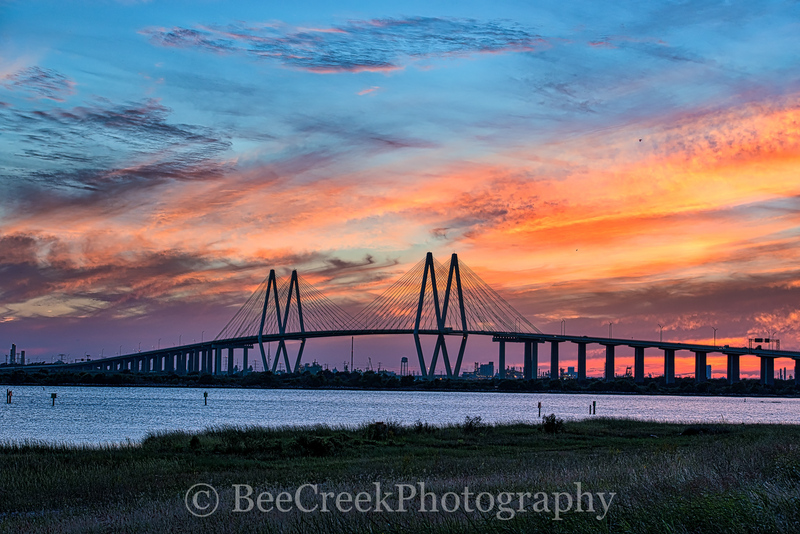 Fred Hartman Bridge – These two images of the Fred Hartman Bridge below are a sunset and night capture of this cable stay bridge that spans the Houston Ship Channel. The bridge is 2.6 miles long and is the main route to Baytown and La Porte. We like the first image as we captured this wonderful sunset colors over the ship channel and we also like the second version as night has set in over the ship channel with the lights on the bridge giving that moody capture. 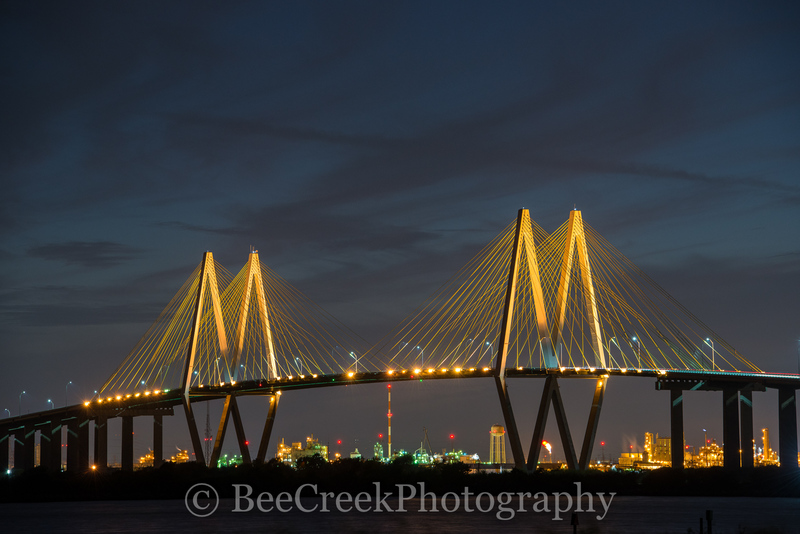 Fred Hartman Bridge Night – The Fred Hartan bridge after dark with the lights on giving it a golden glow against the night sky. The bridge span 2.8 miles across the ship channel from La Porte to Baytown Texas. The bridge was built to replace the tunnel that went underneath the water so they could dig it out for bigger ships to pass. You can cleary make out the refinery underneath the bridge even the fracking flare. 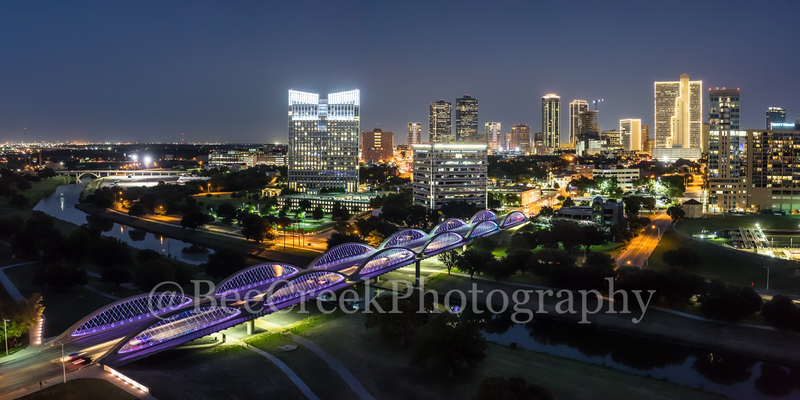 Houston Skyline From Above – This is a aerial view of the Houston Skyline with the Buffalo Bayou, Elenor Tinsley Park and the Jaimal Skate Park all in the image below. You can also see the Sabine St. Bridge along with the Allen Parkway and on the other side is Memorial dirve running along the other side of the park. The city view includes the usual skyscrapers like the Chase Tower, Heritage Plaza, Wells Fargo, and the 1400 Smith St. buildings just to name a few. You can see the Houston City Hall building at the base of the buildings where it is dwarfed by the high-rise skyscrapers since Houston has some ot the tallest buildings in the southern US. We were able to capture this high quality aerial image over Houston because we use a full frame camera on our drone for out still photographs so we can get the best image which can be printed easlity as a 20 x 60 or larger size without loss of resolution. 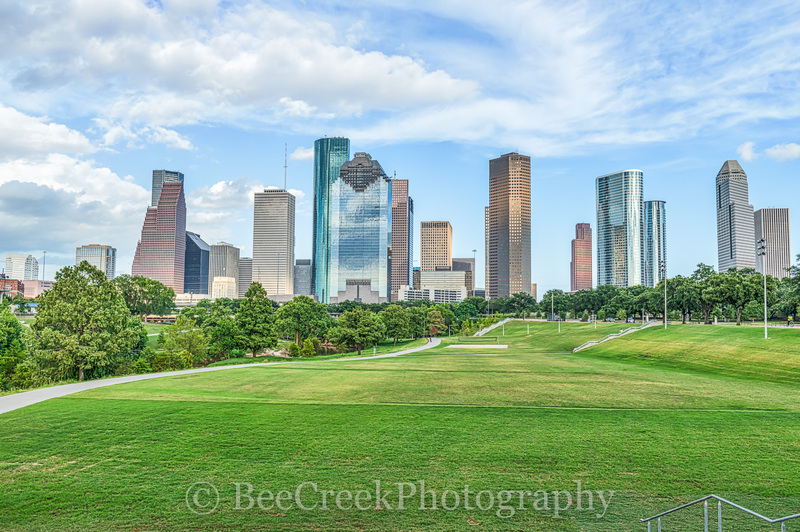 This is one of the many parks near downtown that also has a great view of the Houston skyline. There are many hike and bike trails with fields for playing ball or start up a game of volley ball all with a wonderful cityscape with all the skyscraper high rise buildings in the city as a backdrop. The Buffalo Bayou run along side of the trials throught out the park. 3. 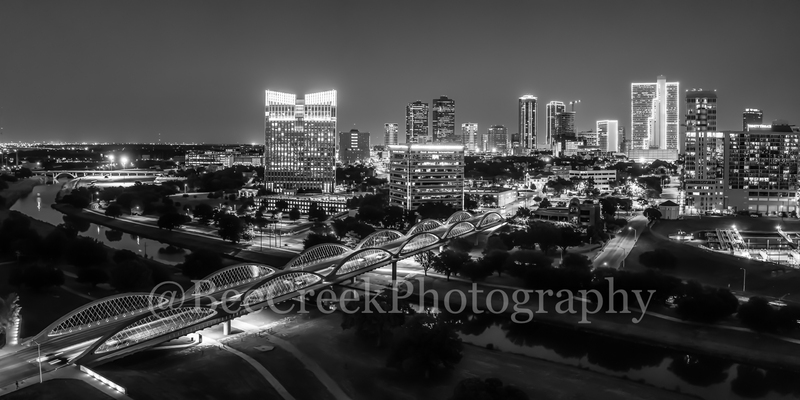 Eleanor Tinsley Park Night –Here are a couple of image taken of the Houston skyline downtown after dark from the Eleanor Tinsley Park. You really get the feel for how impressive this city skyline really is from here at night with the lights in buildings on it gives this sense of how close they are. 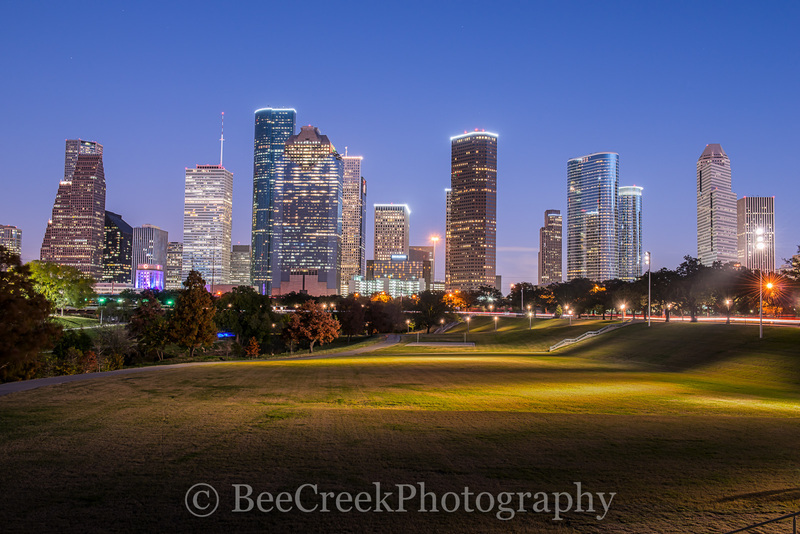 This is one of my favorite image of the Houston skyline as the blue hour really pops the buildings and the park lights turn on which show just how close the city is to one of the many parks that run along the Buffalo Bayou in the city. Another Houston skyline panorama at night in the downtown area which include all the high rise buildings like the Well Fargo, Smith Street, the American Bank, Heritage Plaza and more. Houston is a city of skyscraper some of the tallest buildings in the south are located in here in the downtown area. 4. 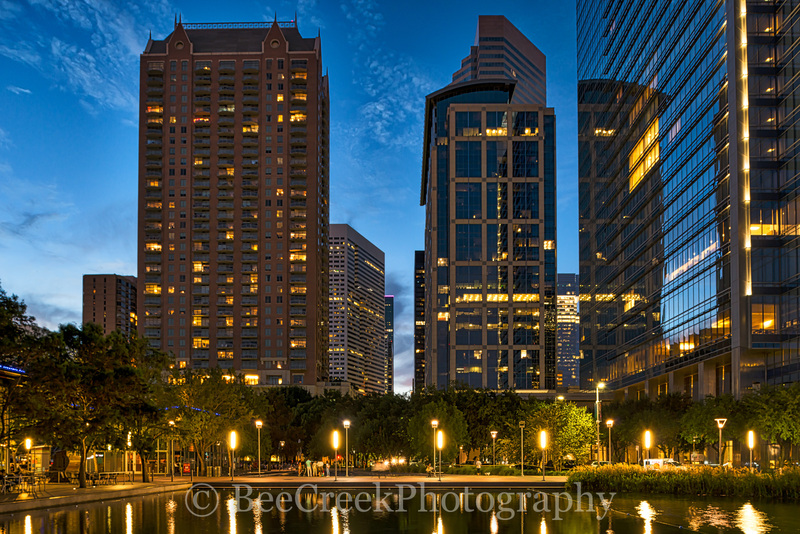 Discovery Green Park- The discovery Green Park is located right across the street from the George Brown Convention Center in the heart of downtown Houston with all the city skycrapers as a backdrop to this great park. The park has a lake, restaurants, walking trails, and many activities like music, yoga, kayaking, and even ices skating in the winter. 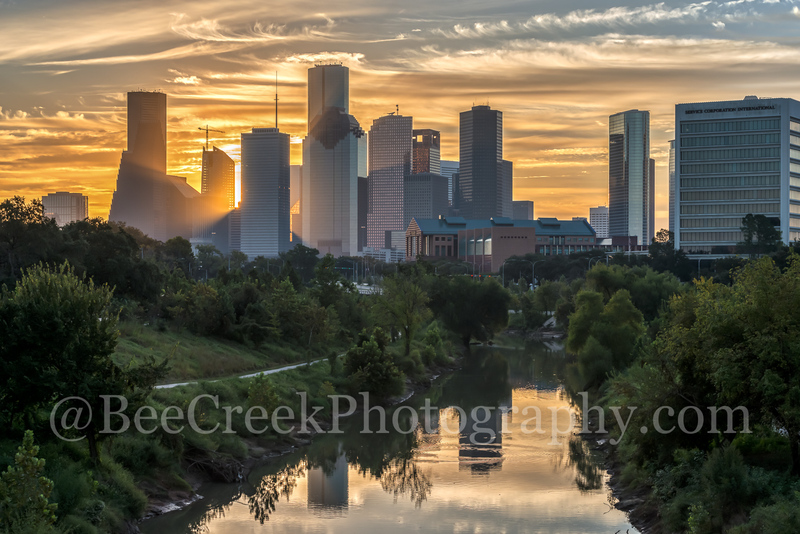 Houston Golden Glow – This capture of the Houston skyline was in the early morning at sunrise just after the sun came up and it gave these swirling clouds over the city a golden glow and the Buffalo Bayou also caught the reflection in the water. You can see the sun light peaking out between the skyscraper in the downtown area. This image was used in the Texas Monthly superbowl magazine in the astronount helment. 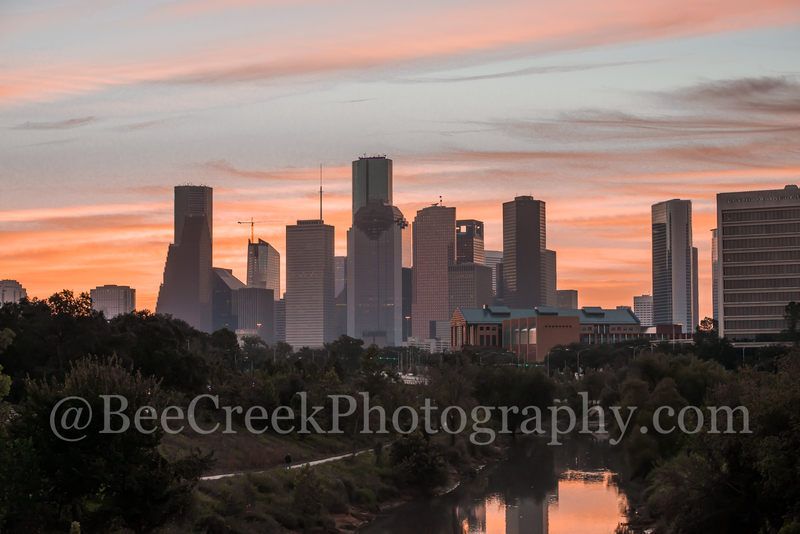 Sunrise Over the Bayou – Another capture of the Buffalo Bayou in downtown Houston as the sunrise was just begining to come up with the skyline of the city in view. You can see the reflections in the waters of the Bayou as the pink sky reflect back into the water. Posted in Best Of and tagged architecture, best of houston, buildings, city, cityscape, downtown, Houston, images, skyline, skylines, skyscrapers, Texas Monthly, tourist, urban on May 27, 2017 September 26, 2018 by Bee Creek Photo.